In 1933, the Edevane family home, Loeanneth, hosts a grand party. Sixteen year old Alice Edevane is especially excited because she's about to share her great writing idea to a person she shouldn't have fallen in love with. By midnight, the family are torn apart and Loeanneth is abandoned forever. Seventy years later, Sadie Sparrow is sent to her grandfather's for some time off from the Police force. She accidentally comes upon Loeanneth and the events of the night of the party unravel as Sadie begins to delve into the family history. In doing so, Sadie reaches out to Alice who has now become a famous detective novelist. Suddenly, Alice is thrusted back into her past but she's not sure she's ready to revisit it. 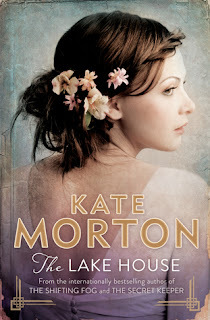 Kate Morton seems to write according to a formula revolving around family mysteries that are resolved in the present time but always end up leaving me shocked and in awe at how well she writes. Morton excels in writing vivid, descriptive imagery including the setting, character and context. It's very easy for me to visualise how a character looks like and the actual scenery. In The Lake House the family's estate is grand and beautiful, and it's so easy to envision it because Morton is skilled in showing not telling. Even in its decaying nature, there is still a sense of the summery days where the story re-visits to recount the past. There's a nostalgic feeling as I read, and it's a common perception when reading any Morton novel. I love that I got both the present and past, interweaved into each other so that I was literally on the same page as Sadie as she slowly inched to the truth. The more that was revealed, the more surprised but also saddened I was. Morton explores family ties, loyalty and trust, but also writes a great recount of PSTD that allowed me to further understand the tragedy of such a condition. Each of Morton's characters all leave a distinctive impression, whether it be a relatable aspect - most often a flaw - or because I've become so involved in their life to let go. Sadie is definitely a vehicle to drive the story, but that doesn't deter from me admiring how hard-working and smart she is. Alice was the more intriguing character because I got to witness her both when she was young until old age, and how the events of the past had defined and changed her. I remember a lot about their lives and their history because of how involved I was in their story arc and how it progressed. I liked the unraveling of the mystery, paced well enough, although I'm not going to lie there were parts I did gloss over. The ending was heartwarming, albeit a little too convenient but does play on the idea of fate a lot. I think what keeps me on edge all the time is how Morton will allude to a certain ending, but is so much further from the actual events that happen, which leads to a great surprise. A pleasant read, although not the best from Morton.